The Gallagher Law Library Chinese legal research guide is completely revised, with a new look, a new link (http://guides.lib.uw.edu/chineselawa-z), and a new name: Chinese Law A-Z. Detailed questions about East Asian legal research? Contact Rob Britt, Coordinator of East Asian Library Services in the Library's East Asian Law Department. Do you ever wonder what works cite a particular article you've read? How about an article you've written? There are many tools for finding citing references, in free and commercial online services, such as SSRN, HeinOnline, Lexis, and Westlaw. We have a new guide explaining some of them, with lots of examples to illustrate the different searches you can use. Check out Finding Citations to Articles. 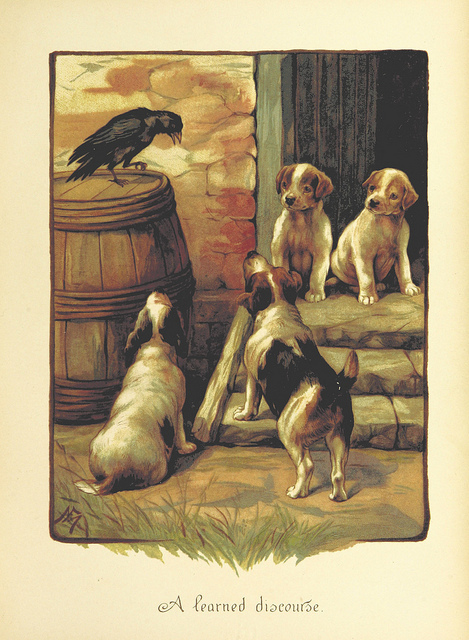 Graphic: "A Learned Discourse," from Edith Nesbit, Our Friends and All About Them (1893), available in the British Library's photostream on Flickr.